Martin Shkreli has lost his megaphone. Shkreli has been temporarily kicked off Twitter and its live-streaming platform, Periscope, after making unwanted advances toward journalist Lauren Duca, the weekend editor of Teen Vogue. The former pharmaceutical exec became infamous in 2015 after he unapologetically raised the price of a drug used by HIV patients. He was later indicted on unrelated fraud charges and has since used social media to draw more attention to himself. Duca reported Shkreli to Twitter in a tweet to CEO Jack Dorsey on Sunday. "How is this allowed?" Duca asked. She included two screenshots of Shkreli's Twitter profile page. One was a photo of Duca and her husband -- a photo Shkreli had apparently manipulated to put his face in place of Duca's husband. The second screenshot showed Shkreli's Twitter background image: a montage of photos of Duca and text that said, "For better or worse, til death do us part, I love you with every single beat of my heart." Those are the lyrics to a popular '90s love ballad. In addition, Shkreli's Twitter bio read that he had a "small crush" on Duca. "Hope she doesn't find out," it said. Duca is the author of a Teen Vogue op-ed, "How Trump is Gaslighting America," which went viral in December. She has 132,000 followers on Twitter. A Twitter source confirmed to CNNMoney on Sunday that Shkreli has been temporarily suspended from the platform for his behavior related to Duca. Twitter's rules prohibit "targeted harassment," according to a Twitter spokesperson. People who get suspended can appeal to Twitter, spelling out why they believe the suspension should be reversed. Shkreli had previously direct messaged Duca on the platform, asking if she'd be his date to the inauguration on January 20, according to a tweet by Duca. "Martin Shkreli is engaged in targeted harassment, and absolutely deserves to have his account suspended," Duca said in a statement to CNNMoney. "Trolling seems to be an automatic occupational hazard for female writers who receive any level of professional attention. That's something Twitter needs to work harder to fix, but obviously the problem runs far deeper." After he was suspended from Twitter, Shkreli continued streaming Sunday afternoon to his 33,799 followers on Periscope. He used the platform to broadcast a phone call he had with a New York Daily News reporter seeking comment about the suspension. Shkreli refused to answer the News reporter's questions, saying he had told them in the past not to contact him. He accused the paper of harassing him and threatened the reporter. He later streamed more phone calls with reporters, his father and other callers about Twitter and Duca. The photo on Shkreli's Periscope page is the same manipulated image that Duca had flagged to Twitter. "I just sort of feel like I'm the victim here," he told one caller. Shkreli's account was taken down around 5:30 p.m. — several hours after he started broadcasting. When contacted by CNNMoney, Periscope provided no statement and referred a reporter to its rules on harassment. CNNMoney reached Shkreli over email on Sunday. "Sorry no CNN for me," he wrote. 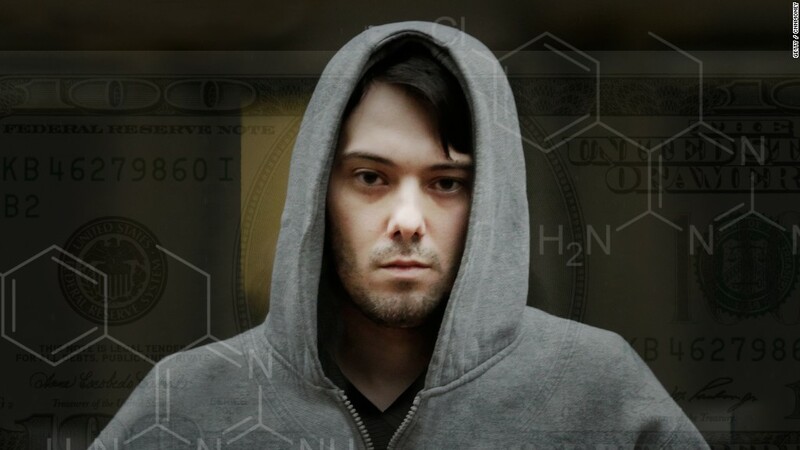 Shkreli first made headlines in 2015 when he raised the price of the AIDS drug Daraprim from $13.50 a pill to $750. He said the increase was necessary to keep a profit. Later, he was charged with securities fraud and conspiracy for allegedly deceiving investors about his disastrous financial performance as a hedge fund portfolio manager. He is set to stand trial this June. Since his indictment, Shkreli has used Twitter and Periscope to livestream himself playing videogames in his pajamas and chronicle trips around New York to about 200,000 followers. Shkreli's suspension came relatively swiftly for Twitter (TWTR), which has been criticized by users who say the company's response to online threats and harassment is slow, if sometimes nonexistent. When actress Leslie Jones was battered with hate tweets last summer she blasted Twitter for its inability to filter hateful content. Twitter later removed Breitbart tech editor Milo Yiannopoulos, who was widely seen as the instigator for the campaign against Jones, from its platform. Many Twitter users have also urged Dorsey to create a comprehensive plan to rid the platform of harassers after he solicited feedback last month. Although the company frequently updates policies on abuse and harassment, it's unclear why Twitter decides to keep certain tweets up while deleting others. In a BuzzFeed survey of 2,700 Twitter users, about 90% of respondents said the social network did nothing after they reported abuse. "For any of my personal aggressors reading this: Would I rather you leave me alone? Of course! But know that you will never, ever silence me," Duca said in a statement. "Every one of your messages only serves to strengthen my resolve. I promise to never stop fighting." --CNNMoney's Aaron Smith contributed to this report.